Subtitle: Music for The Last Temptation of Christ, a film by Martin Scorcese. "I have put together two albums around the music of The Last Temptation of Christ. This album is my work; the other, Passion Sources, represents a selection of some of the traditional music, sources of inspiration and location recordings. I was excited to be asked to work on the music. When I first discussed the project with Martin Scorsese in 1983 I wanted to find out how he was intending to film this controversial novel. He wanted to present the struggle between the humanity and the divinity of Christ in a powerful and original way, and I was convinced by his commitment to the spiritual content and message. He is an excellent and very musical director and working with him has been a great experience. After we finished mixing the film there were some unfinished ideas that needed developing, and I took some extra time to complete this record. There are several pieces that were not able to be included in the film and I felt that the record should be able to stand as a separate body of work. I chose the working title for the film - Passion. Track A1: The Doudouk is playing an Armenian melody; 'The Wind Subsides'(recorded for Ocora Records under the direction of Robert Ataian). Track A4: This piece incorporates a traditional melody from Kurdistan telling of the unhappy love of a young girl for Bave Seyro, a legendary warrior. (Kurdish Duduks are from Unesco Collection - A Musical Anthology of the Orient, General Editor Alain Danielou for Musicaphon Records). Track A8: This was written around a traditional Egyptian rhythm which is performed to fend off evil spirits. Track A10: Based on an improvisation by Shankar and Peter Gabriel. Track A11: The Ney Flute is playing a traditional Armenian melody. 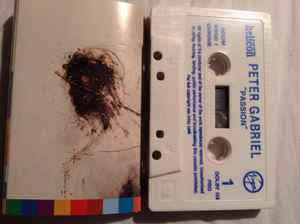 Track B2: Based on an improvisation by Mahmoud and Peter Gabriel. ℗ 1989 Virgin Records Ltd.
© 1989 Real World/Virgin Records Ltd.